This is the third installment of 10 Things To Expect When Downsizing! See links to the previous articles below. This wisdom was shared with me many years ago by a much older woman. She was right! You may be very disappointed when you find that your kids don’t want what you have saved for them! Believe me, you are not alone. Every day in our store we have consignors bring us items that they envisioned going to their children. It is very common to save furniture, china, and keepsakes, thinking the items will be treasured by the next generation. Often the realization that your kids don’t want what you have saved for them leads to a lot of family drama and frustration. The rejection feels like a statement that your things are not good enough or family history is not valued. Today most people get married with more wealth and material items than previous generations. Chances are good that your children have already developed their own style by the time they are in their mid-20’s. This does not mean that your children won’t want anything, but they may not want as much as you anticipate. 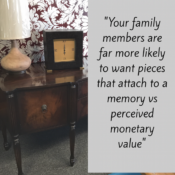 After talking with lots of people that have been through this, I have learned that your family members are far more likely to want pieces that attach to a memory, versus a perceived monetary value. You daughter may be much more likely to want your mother’s Hepplewhite buffet if she can remember her grandmother serving on it and saying “y’all come eat”! If what you are hoping to gift to your children is furniture that was never used, from a room that was off limits, it is likely there will be no attachment for the next generation. Even college students today have stylized apartments that reflect what is seen at Pottery Barn and Ikea. It is very easy to order relatively inexpensive items online that arrive at your door in a box. It is true that this furniture is often made of particle board and is not as well made as your solid wood furniture. However, to a younger generation, the look is often valued more than the quality (refer to our previous article: Letting Go Means You Lose Control!). 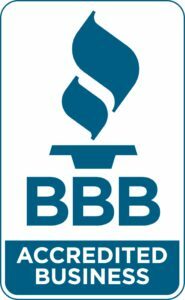 Several times a month people come into our store and say that they first bought inexpensive – but stylish – furniture a few years ago and are already replacing it. A lot of the furniture out there is not made to be taken apart more than once. In a mobile society that is a recipe for furniture failure! Still the makers are skilled at creating a modern look at a cheap price. This is often a death sentence for antiques, solid wood furniture and your expectation that your children will love and appreciate all that you have saved for them. So, what to do? First identify what you are keeping and what you are willing to gift, sell or donate. It is a good idea to invite everyone to claim what they want ahead of your move. This will give you a more realistic idea of which pieces will be left for you to deal with. You will need to require family members and friends to come to the house, look at the items you are offering, and claim them. If some are out of town Skype and Facetime work well too! Next, be sure to give everyone a deadline to pick up the items and move them to their new space. This is a good time to ask your children to take keepsakes, trophies, scrapbooks, old artwork, and any personal items left in your home. Again, be prepared for your children to tell you they do not want all that you have saved for them! Remember you are no longer storing items for family members. If something needs to be stored off site, that is the responsibility of the new owner. Putting your items in a storage unit at this point will only delay the sorting and downsizing process and make it more of a headache for you down the road. Don’t fall into the “I’ll think about it tomorrow” trap! Offer the items you are willing to gift, commit the item to the new owner, and expect them to get it moved by your deadline. Peace of mind will follow! After you have offered your items to family and friends, you can then contact us to see if we can consign what remains. We will be happy to talk/walk you through the process. Just remember to contact us well ahead of your move so that we have room for your items. You can find out more information and how to consign with us @interiorsbyconsign.net.